Hinge at the hips to lower the torso somewhere between 45 degrees to slightly above parallel with the ground. Grasp the bar so that the hands are just outside the body. Use a supinated (underhand) grip. Brace with your abs in order to keep a neutral lower back. Pull the shoulder blades down with your lats to set tension in the thoracic spine. Keep a neutral cervical spine. Slightly extend the knees and hips and bring the bar up to just below knee level. While maintaining tension in the lower, middle, and upper back, retract the scapulae and pull the elbows back towards the torso close to the sides of your body in a “tucking” motion. The bar should graze the thighs and end up making contact somewhere between the top of the hips and bottom of the sternum. Once the bar makes contact with the body, don’t pause the movement. Focus on squeezing the muscles between/under the shoulder blades as tight as you can, for the moment you are at the top of the rep.
With tension and control, lower the bar in the opposite motion as the concentric action until the arms are completely extended. You can allow the shoulder blades to protract forward to accentuate the eccentric stretch on your lats and mid-back musculature. However, this should not be done to the end range of scapular protraction. 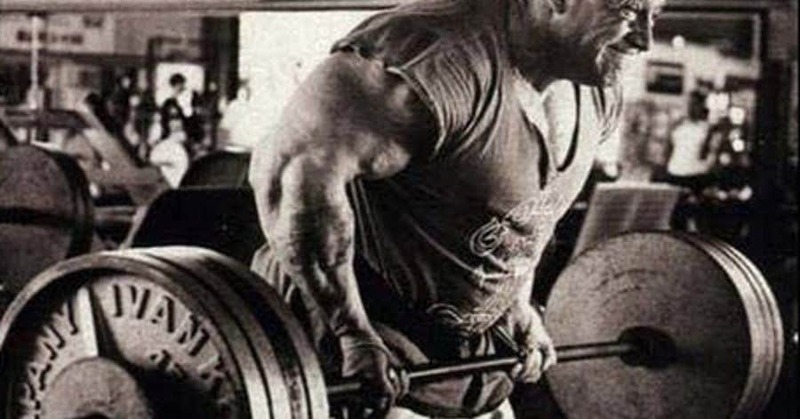 If the bar is not reaching the body, reduce the weight. Focus on maintaining core tension and “tucking” the elbows back towards the body. Also, actively keep the shoulder blades depressed and retracted for the entire movement. Focus on retracting and depressing the shoulder blades. This action will keep the humerus in the back of the glenohumeral joint and actively improves stabilization. If retraction and depression seems too difficult, reduce the weight. NOTE: It's okay to bring your shoulders forward at the bottom of the rep, as I discussed above. Slight up and down movement of the torso is to be expected. Avoid large and erratic jerking motions. Maintaining core tension and focus on controlled deliberate movements with the shoulder/arms. If tension is lost and jerking is unavoidable, reduce the weight. Maintain and actively tensed position throughout the lift. Make sure your posture is rigid enough and your hips are hinges enough to “feel” the weight through te developed tension in your hamstrings. Be sure to retract and depress the shoulder blades for the entirety of the movement as well. Tucking the elbows is key to the exercise. Wide elbows will completely change the leverage/moment arm of the movement. Imagine like you are performing the opposite of a close grip bench press. Pay attention to your torso angle. Too wide an angle (torso too upright) will be closer to an upright row. Too small an angle (closer to parallel with the floor) will be too difficult to use enough weight for an adequate stimulus/will negatively impact bar path. Imagine your elbows tracking in a “J” pattern towards your body. As the elbows tuck, you should be “swooping” the hands towards the top of the hips. The “J” pull and the elbow “tuck” should land the bar somewhere near the middle of your abdomen. If the bar is higher or lower than that spot, double check your starting position. Do not allow the upper back to round. Posterior rigidity is key. 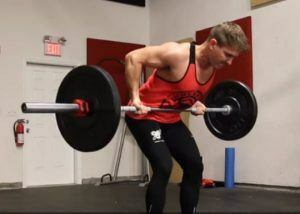 Yates Rows can be used as a back development/strengthening tool for every level of lifter. 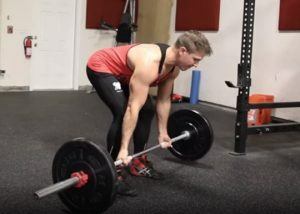 When compared to a regular barbell bent over row, the slight difference in bar path and hand position places slightly greater emphasis on the middle traps and is excellent for helping with thoracic stabilization and scapular mobility.